Our circuit-breaker shop services align our extensive power systems expertise with the latest electrical hardware to handle any electrical system. Whether we help our clients on location or at one of our facilities, we can get your facility’s power system working safely and efficiently. The Absolute Testing Breaker Shop Division has access to electrical devices that are out of manufacture or are deemed as obsolete. When it is necessary to replace a Vintage Part with a direct replacement, Absolute Testing has multiple sources and resources that can provide you with a solution. We have sources for repair parts for equipment that cannot be replaced. We provide the parts, test the unit get the customer back in business! Perform partial disassembly for complete as found visual inspection. 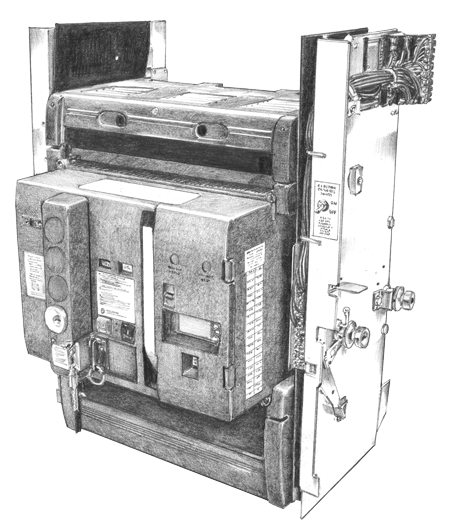 Clean and lubricate circuit breaker per OEM and NETA maintenance guidelines. Perform all tests for full Power DB test reports using OEM and NETA specifications. Return breaker to normal service. Complete disassembly to sub structure and Rebuild including powder coating frames and re-plating of all current carrying parts. Replace manufacturer recommended grease in all pivot points. Reassemble and test. Limited disassembly polish and refurbish all current carrying parts. Mechanical inspection. Replace manufacturer recommended grease in all pivot points. Reassemble and test. Repaired circuit breakers have a one-year warranty on parts and labor.